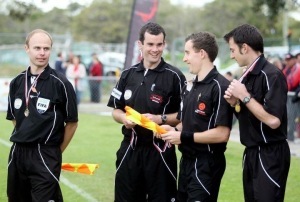 Welcome to Northern NSW Football referee's website. 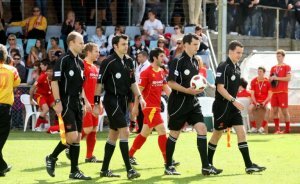 We are the peak refereeing body for football in Northern NSW providing officials to the NBN State League, NEW FM 1st Division, The Zone Premier League and Zone league 1, 2 and 3 competitions. We are also responsible for providing referee's to the various National League competitions. 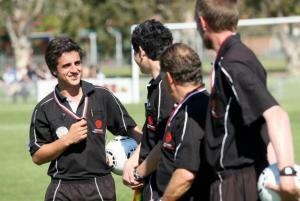 NNSW State League referee's strives to provide the highest quality members to the competitions we officiate. All members are required to attend weekly fitness training, monthly coaching sessions as well as regular tests of the laws of the game. Members also recieve inspections and feedback on the majority of matches they officiate on. NNSW State League Referee's recruits from other branches and train's potential members who are interested in officiating on men's football. Contacts regarding apply for membership or induction courses can be found on the contact's section of our website. Please feel free to view all the information available on this site at your leisure. 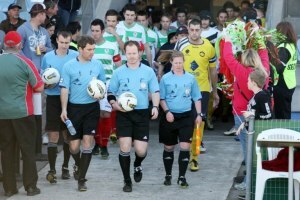 Northern NSW State League Referee Tanya De Boer first appointed to the FIFA Female Assistant Referee's list in 2012 has backed up her achievements being appointed the the prestigious AFC Elite womens Assistant Referee's Panel for 2013. Tanya De Boer a 29 yr old Tanya originally from Lismore moved to Newcastle to persue work and football committments. Tanya has been officiating on the National Youth League and W League for several seasons. Her international appointments this year included officiated on the AFF womens tournament this year where she was appointed to the Final of the event. She also officiated on Northern NSW State League Grand final in 2012. On Behalf of all the members of Northern NSW State League Referee's congratulations to Tanya and for the outstanding achievement on being appointed to the highest level of officiating in the country, and Asia!